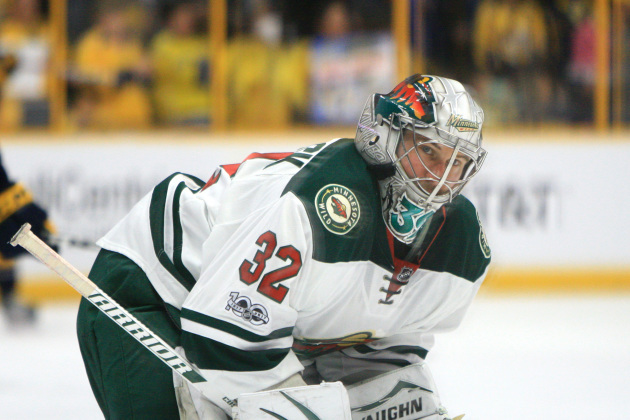 Starter Devan Dubnyk has had control of the Wild’s crease for more than two weeks, rattling off six straight starts. But his run is about to end, as the Wild will tab backup Alex Stalock to face the Devils Thursday in Newark when the team’s three-game road trip continues. This will be Stalock’s first start since Feb. 3 when he surrendered four goals on 29 shots in two periods to the Stars in Dallas. Stalock was pulled after the second period, absorbing the eventual 6-1 loss to stand 8-9-2 with a 2.77 goals-against average and .914 save percentage. In two career starts against New Jersey, Stalock is 1-1 with a 3.51 goals-against average and .877 save percentage. He and the rest of the team was on the ice Wednesday for practice after a day off Tuesday. Thursday is the first half of a back-to-back, with the Wild concluding its road trip Friday in New York against the Rangers. Backups tend to receive the second game of back-to-backs, but Boudreau acknowledged that’s not always fair to the backup. And although the team hasn’t played since Monday when it posted a 5-3 win over the Islanders in Brooklyn, it certainly started the road swing off with a dose of positive momentum that could help it when it resumes action against the Devils. 899: Career points for center Eric Staal. 3-2-1: The Wild's record in its last six road games. 3: Goals in winger Jason Zucker's last two games. 5: Points in seven career games against the Devils for winger Zach Parise. 4-1: New Jersey's record in its last five games. New Jersey holds the first wild-card spot in the Eastern Conference and is just two points behind Philadelphia for the third seed in the Metropolitan Division. Winger Taylor Hall has been a key catalyst for the Devils. He leads the team in goals (25), assists (38) and points (63). Twenty-seven of those points have come during a 19-game point streak for Hall. Rookie Nico Hischier is also enjoying a successful season, with 13 goals and 40 points. Hischier is the reigning NHL first star of the week after posting four goals and seven points in four games last week.